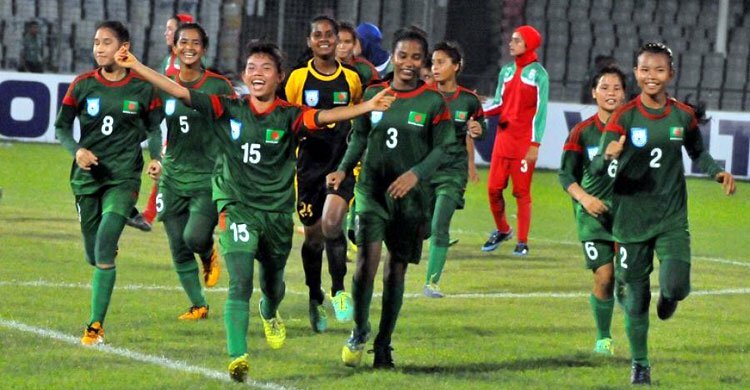 Dhaka, Oct 22 : Bangladesh Women’s Football team, now in Tajikistan to compete in the Group D matches of the AFC U-19 Women’s Championship Qualifiers, undertaken a comprehensive training at the Artificial Turf of Tajikistan Football Academy in Dushanbe Monday afternoon. Bangladesh team, which was placed in Group D of the AFC meet along with Asian giant South Korea, Chinese Taipei and hosts Tajikistan, will play South Korea in the opening match on October 24, face Chinese Taipei on Oct 26 and hosts Tajikistan on Oct 28, all in the Pamir Stadium in Dushanbe. Bangladesh team planned to go for a walk Monday afternoon, followed by individual development plans at the hotel gym and video and group activities after the dinner, according a message received here from Bangladesh Football Federation on Monday.